I guess you either love Banksy or find it really hard to stomach his ideas and creations, but there is no denying he is a major artist of our time and luckily for me my birthday this year was spent visiting his latest creation Dismaland! The location of Weston-super-Mare may seem strange however Banksy holidayed there as a child so for him I guess it was the obvious choice. Using the seaside resort’s derelict and disused Tropicana Lido also added an extra level of quirkiness to the exhibition. The exhibition featured art, sculptures and short films from artists all over the world including Banksy himself of course! I was personally looking forward to seeing Jimmy Cauty, Damien Hirst and Brock Davis’ brain-twisting creations! Once you get inside you get a feeling of how the day will run when the security guards ‘meet’ but not so much ‘greet’ you, more of an interrogation and attempt to humiliate you! I kind of enjoyed it. As soon as you enter the park any sense of building excitement you had outside in the queue drops like a stone. We tried to take a map of the park from an attendant, it was teased away from us in a dismal fashion only to then be ripped into pieces and thrown up into the air. As the pieces dropped the faint dismal sounds of the park’s tannoy echoed around the park “welcome to Dismaland”. I must admit, this had us in stitches, much to the dissatisfaction of the attendants! The park itself is full of old run-down rides and fun fair games that you will never win; topple the anvil with a ping pong ball being one of the most ridiculous! If you do win your prize is thrown to the floor for you to pick-up, nice! If you do win your prize is thrown to the floor for you to pick-up, nice! The centrepiece of the park is the Disneyworld-themed castle. Unfortunately Ariel was missing from the lake on our visit (bad weather in the previous week meant she had to be taken to a safe place). Inside the castle the sounds of paparazzi snapping away plus strobing and smoke rising from the floor pull you in and present a carriage with a dying Cinderella hanging from within. I believe this creation was meant to symbolise Princess Diana’s fateful end (controversial as ever Banksy!). Dismaland plus arcade games on the pier and fish & chips in the sun made my birthday not that dismal at all! 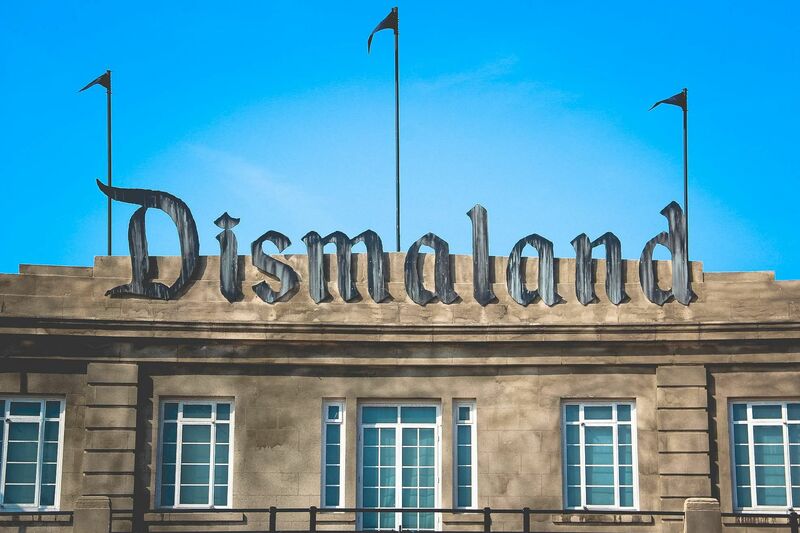 So is Dismaland really that dismal? Well the short answer to that is yes it is, it’s meant to be isn’t it?! What I love most about the whole exhibit is that everything has its own carefully thought out message, Banksy really has everything covered. I really like the fact this exhibition moves Banksy out of his comfort zone of graffiti style messages to using larger structures and sculptures to represent his sarcasm, wit and political views.